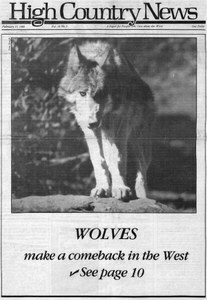 Gone from the West for almost 50 years, wolves recently crossed the Canadian border to colonize Montana's Northern Rockies. Unless the trashing and privatization stops, the intermountain Rockies will never escape their feudal social and economic situation. Those who now control the land and the land managers don't have a glimmer of how to lead the region out of its downward slide. The public has lost the only practicable, two-wheel-drive access to Western Colorado's 75,000-acre Dominguez Wilderness Study Area managed by the Bureau of Land Management.